We all have those recipes that instantly make us feel at home again: whether it’s mac ‘n cheese, meatloaf, chocolate chip cookies, or soup, they just say “comfort”. On Thursday night, after an emotionally-charged first day at a new school, I turned to my mother’s banana bread for a much-needed dose of comfort food. But a day of herding (proverbial) cats left me wanting something a little more adult, a little more elevated: I needed a Dessert. 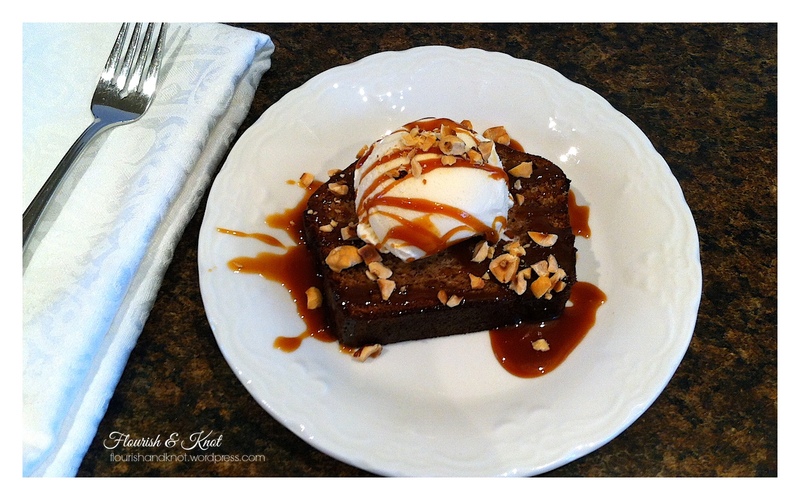 I give you perfection on a plate: banana bread with salted-caramel sauce and toasted hazelnuts! My mom’s banana bread is one of those recipes to which only very special people are privy. I remember accepting it with awed reverence as she prepared me to go off to university. It is better than gold: use it well, fellow foodies. 3. Add the eggs to the butter and sugar mixture and mix well. 4. Mash the bananas well and add them to the egg mixture. 5. In a separate bowl, mix together the dry ingredients. 6. Add the dry ingredients to the banana mixture, a bit at a time. 7. Lightly butter a loaf pan. I line mine with parchment paper, but you can also flour it. 8. Pour in the batter. 9. Bake in the centre of the oven for about 60 minutes. Now, to really make this a Dessert (with a capital ‘D’), you can add a salted caramel sauce, chopped toasted hazelnuts and vanilla ice cream. 2. Once it dissolves, the sugar will begin to caramelize (darken). Don’t stir it once this starts! This should take about 45 seconds to 1 minute. 3. Quickly stir in the butter, cream, and fleur de sel. You may need to take the pan off the heat for this step. 4. Let the sauce simmer for about 1 minute. 5. Transfer the sauce to a heat-proof bowl and let it cool completely. 2. Rub them with a clean tea towel on a wooden cutting board to remove as much of the skins as possible. 4. 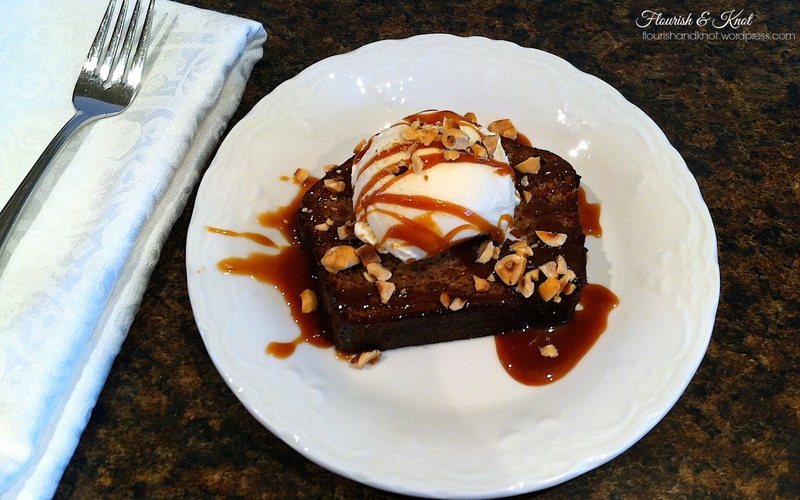 Assemble the dessert: a piece of banana bread, a scoop of vanilla ice cream, a drizzle of caramel sauce, and a sprinkling of hazelnuts! I dare you not to fall in love at first bite! Tell me: what non-traditional spins have YOU put on your favourite childhood foods? Thanks! Try it out and let me know how you like it. It’s so good of you to share this special family recipe. And then make it into something so elegant – very nice of you. I’d love to hear about any family recipes you’ve put YOUR spin on! 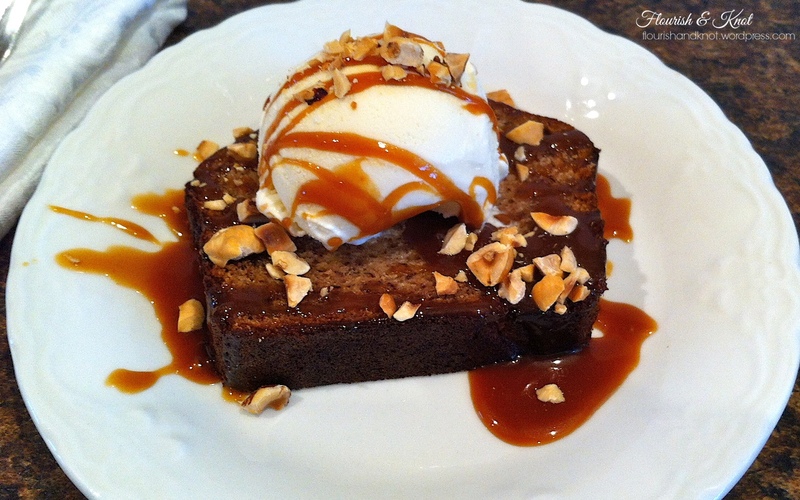 I think thats the most decadent way of eatng banana bread I’ve ever seen! Awesome!! It is truly decadent and delicious! This looks absolutely delicious! Thanks so much! This sounds fantastic! Visiting from the great train blog. Feel like doing one right know. I may need to change some ingredients, like sugar and flour. Thanks for the recipe. Yahoo!! Thanks for the feature! By the way, really looking forward to co-hosting in July.